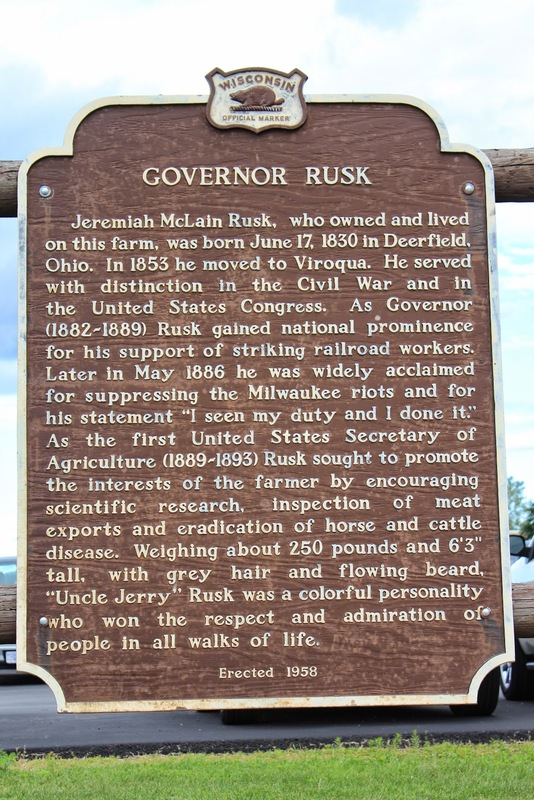 Jeremiah McLain Rusk, who owned and lived on this farm, was born June 17, 1830 in Deerfield, Ohio. In 1853 he moved to Viroqua. He served with distinction in the Civil War and in the United States Congress. As Governor (1882-1889) Rusk gained national prominence for his support of striking railroad workers. Later in May 1886 he was widely acclaimed for suppressing the Milwaukee riots and for his statement "I seen my duty and I done it." 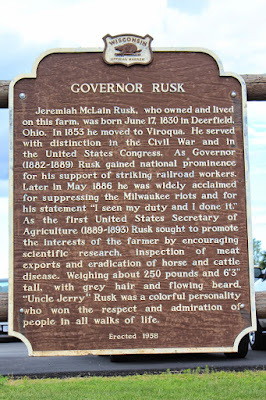 As the first United States Secretary of Agriculture (1889-1893) Rusk sought to promote the interests of the farmer by encouraging scientific research, inspection of meat exports and eradication of horse and cattle disease. Weighing about 250 pounds and 6'3" tall, with grey hair and flowing beard, "Uncle Jerry" Rusk was a colorful personality who won the respect and admiration of people in all walks of life. The marker is at a pull-off on North Main Street / State Highway 27 / U.S. 61, just south of its intersection with Airport Road / County Highway BB, Viroqua, Wisconsin 54665.
is now a car dealership. Prints and Photographs division under the digital ID cwpbh.00062. United States public domain tag to indicate why this work is in the public domain in the United States. Note that a few countries have copyright terms longer than 70 years: Mexico has 100 years, Colombia has 80 years, and Guatemala and Samoa have 75 years, Russia has 74 years for some authors. This image may not be in the public domain in these countries, which moreover do not implement the rule of the shorter term. Côte d'Ivoire has a general copyright term of 99 years and Honduras has 75 years, but they do implement the rule of the shorter term. It's impossible to miss that water tower!